Created as a family-run business as it remains to this day, Golledge has a strong sense of corporate social responsibility. It's present in all of our transactions, our strong partnerships with our clients, profit share scheme for our staff, and our support for local, national and global charities. We run a Give As You Earn scheme, along with regularly making contributions to leading local and national charities. We are proud to be a corporate platinum member of Somerset Wildlife Trust and regularly volunteer, helping with environmental projects including dry-stone walling, scrub clearing and garden restoration. 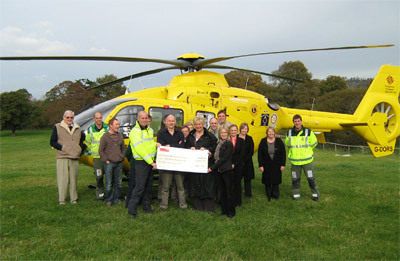 We also regularly donate to Brainwave, St. Margaret's Hospice, Dorset and Somerset Air Ambulance, and Somerset Community Foundation. Our employees are reliable, creative and above all caring. Last year over half of our team completed individual charity events, including the Race for Life for Cancer Research UK, the Moonwalk in aid of Breast cancer charities and the Rock Solid Race in aid of the fight against prostate cancer. Buying from Golledge means, on top of all the other benefits, your frequency components are sourced from a socially responsible supplier. In uncertain times it is more important than ever to ensure we in the business community support human rights efforts throughout the world. That's why we review our Conflict Minerals declaration annually to ensure we will never fuel human rights abuses through the purchase of conflict minerals. Our conflict minerals declaration outlines the processes we undertake to ensure our products never knowingly contain conflict minerals. We are proud of our transparent business practices and take care to ensure we are fair and ethical in everything that we do. We have a zero tolerance policy towards bribery and corruption and are committed to acting with integrity throughout all of our business relationships and dealings. We are also keenly aware of the responsibility we hold as suppliers to the electronics industry. To this end due to ethical considerations we do not knowingly supply products for use in the production of nuclear weapons or other weapons of mass destruction. One of our core values is the upholding of responsible and fair business practices and we are committed to maintaining the highest level of ethical standards in relation to our business activities. Our anti-slavery policy describes the steps we take to ensure slavery or human trafficking does not take place in our business or within our supply chain.